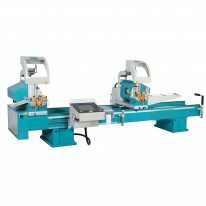 We offer a wide range of saws and equipment for nearly every requirement including precision cutting of lengths and angles. ATech manufactures template copy routers for aluminum and vinyl (PVC) profiles in different versions. ATech Machinery provideshigh-quality manual or automatic infeed and outfeed tables with length stop and measuring systems. 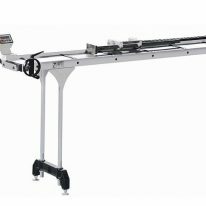 We offer many alternative versions of high-quality manual or automatic infeed and outfeed tables with length stop and measuring systems. These come in 10’, 15’ and 20’ lengths as per your requirement. Our tables are available with digital read-out. Also, optimized cut lists can be conveniently transferred into the infeed table’s PC via a USB port. ATech Machinery provides variety of vinyl (PVC) and aluminum panels and profiles processing CNC machines. ATech Machinery provides single head, double head and four head vinyl welding machines which cover all different levels of production requirements. Welding and Cleaning Machines Category We have been manufacturing vinyl welders for heater plate welding of PVC profiles since more than 30 years. 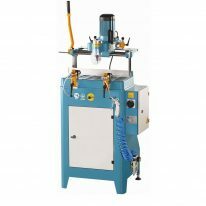 Our extensive product range from bench top type vinyl welding machines to single head, double head and four head vinyl welders cover all different levels of production requirements. We also supply a complete PVC window & door frame production line with four head welder, CNC corner cleaner and robotized system. Our machines are of heavy duty design and extremely user friendly. 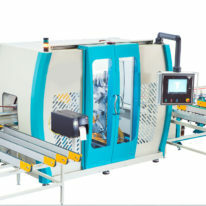 The CNC type machines are equipped with a modem for fast service via remote access via Internet. All our welders are equipped with parameters and settings, which are necessary for the production of vinyl (PVC) windows and doors. It is guaranteed that only top brand quality components are used. 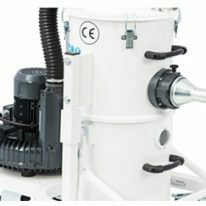 We supply a rich variety of corner cleaning machinery and equipment for processing and cleaning of vinyl profiles after welding. 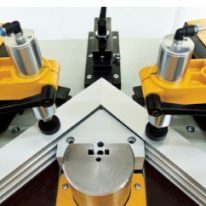 Our corner cleaners come with different cutter stack capacity, where each cutter stack is assigned to a control button on the control panel of the corner cleaner for automated activation. So, ATech offers the right machine for each purpose and every production requirement. ATech Machinery End Milling Machines provides single head, double head and four head vinyl welding machines which cover all different levels of production requirements. provides single head, double head and four head vinyl welding machines which cover all different levels of production requirements. 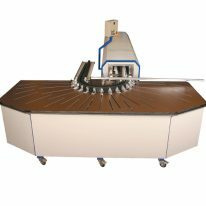 Our horizontal end milling machines are specially designed for milling sets of profiles (both aluminum and vinyl) in which the cutter unit needs to be changed several times in the same set. 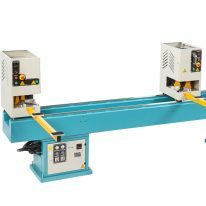 ATech supplies a wide range of end millers varying from bench top type to manual and automatic models. 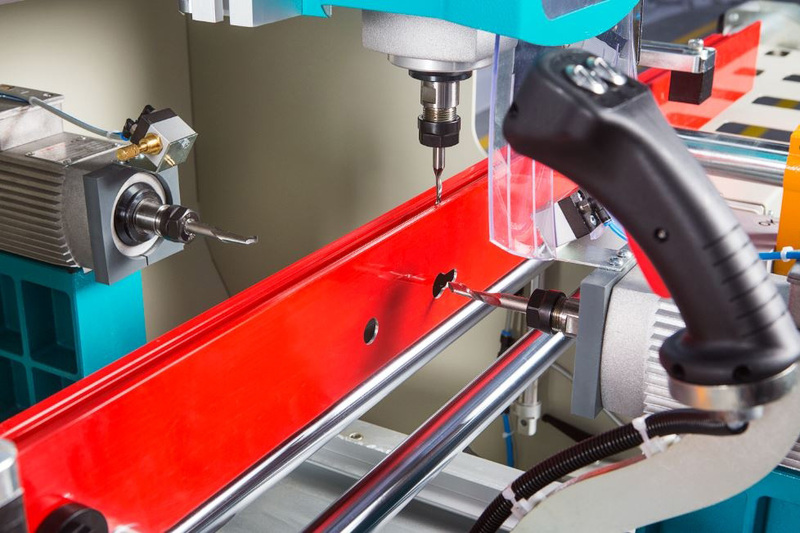 Our automatic end milling machine is equipped with a quick-release cutter stack holder making different applications on profiles quicker and easier. The cutting zone is fully guarded to protect the operator in all the machining operations. The cutter stack feed is hydro-pneumatic ensuring precise and vibration-free end milling of your aluminum and vinyl profiles. 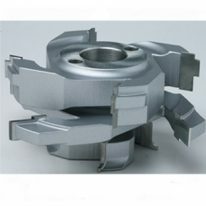 We also manufacture custom cutter stacks according to your profile drawings, thus providing turnkey solutions. Heavy duty and user friendly design distinguish our end milling machines from all other machines in the market. ATech Machinery manufactures template copy routing for aluminum and vinyl (PVC) profiles in different versions. We supply bench top type copy routers both with brush and induction motors, manual copy routers with pneumatic clamping and copy routers with twin motors for additional horizontal triple drilling. Our copy routers can be equipped with pneumatic spray mist lubrication system for fabricating of aluminum extrusions. We also make custom copy templates for your special applications, or supply blank copy templates. 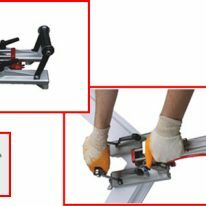 PVC profile bending machines are used to make arched vinyl (PVC) windows. ATechMachinery supplies both hot air and hot liquid PVC profile benders. ATech Machinery provides heavy duty hydraulic corner crimping machine for corner joining of aluminum extrusions in the window and storefront industry. 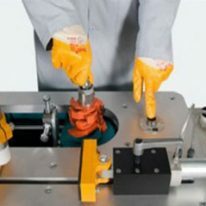 ATech Machinery supplies vinyl corner cleaning toolssuch as manual cleaning tools and pneumatic cleaning tools for straight surface, inner and outer corners. ATech Machinery provides custom tooling like cutter stacks for end milling and corner cleaning machines as well as customized welding and saw fixtures. We manufacture and supply highest quality precision custom tooling like cutter stacks for end milling and corner cleaning machines as well as customized welding and saw fixtures. We have been servicing the vinyl, aluminum and wood industry since 2001. Once you provide us your profile drawing we send you our quote the next business day. We guarantee most competitive pricing and fast delivery. Custom cutter stacks are delivered usually within 2-3 weeks. After we receive your tooling order our technical department designs the respective cutter stack and/or fixtures, and send it for your review and approval. In addition to our hot liquid and hot air vinyl (PVC) profile bending machines we also design and supply custom bending snakes & inserts for your vinyl profiles. 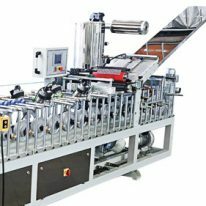 ATech Machinery provides vacuum chip collector and filtering machines among its optional equipments for vinyl, aluminum and wooden processing machinery. All our machines come with 2 year warranty. ATech is a leading supplier of an extensive range of machinery & equipment for the fabrication of vinyl & aluminum extrusions and wood industry with state-of-the-art technology, customized solutions and a comprehensive scope of services. ATech Team work closely with each customer to find out the best possible solution to their window & door production requirements processing vinyl, aluminum and wood. 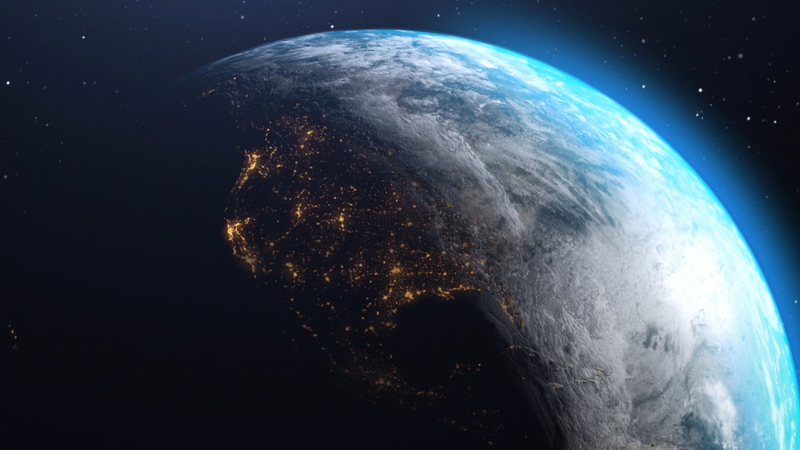 Our machines are capable of meeting a variety of production needs for small and medium size plants, as well as for large corporations with high level production. Our wide range of machinery includes double head saws, upcut saws, upcut miter saws, end milling machines, vinyl welders, copy routers, corner cleaners, bending machinery, custom tooling like cutter stacks, fixtures, bending molds and many more. We use the best quality materials and a controlled production process for each machine we manufacture, which provides efficient and accurate profile processing in guaranteed quality. Combined with our skilled and efficient spare part and after-sales service, we can provide uncompromising reliability.